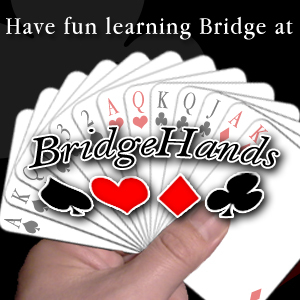 BridgeHands: Bridge Card Game - The Bridge Game is Fun to Learn! The Bridge card game is a partnership game. No matter how good you and/or your partner might be, unless the two of you play in harmony it will be difficult to obtain a good result. The Bridge game requires you to think on several dimensions! Effective Bridge players analyze and deduce, recall, notice behavior subtleties, keep calm and focused, etc. The Bridge card game can be a lifetime of learning -- you can always learn more about the game, people, and maybe even yourself! In fact, unlike many sports, you can continue playing well into your "Senior Years." The Bridge game can be fun! As you and your partner perform well and achieve goals, you have a right to be both elated and proud. The game is a real challenge! The variables include your holding, other's assets, the relationship between everyone's cards, the skills and disposition of the players at that moment, and even outside factors. Whew! Its is a great way to meet people. You can play the Bridge card game in a party atmosphere or a competitive environment against numerous others. Either way, its an exciting pastime that provides an opportunity to build relationships. In fact, the the Bridge card game offers a microcosm of interrelationships between people. Watching what happens at the table provides an opportunity of what happens between people in real life. Knowledge, skill, learning, communication, trust, compatibility, risk assessment and mitigation, as well as many other behavioral traits can be observed at the table. Have you ever thought about how many different hands might be dealt to the players at a table? Would you believe it's 53,644,737,765,488,792,839,237,440,000 ? (that's 29 digits) Mercifully, 80 percent of the hands dealt to a player are one of seven different shapes -- that is the number of cards in each of the four suit. We will discuss these terms shortly. Also, there are millions of combinations of how to play the cards at the table, and certainly not everyone has the same ideas or tactics on how to achieve their goal. In fact, two different players playing the same cards may even have a different goal. Fortunately, a limited number of basic methodologies recur each time we play a hand. We previously mentioned that other factors like communication, behavior, and others influence our results. You get the point -- the game isn't necessarily a trivial game. So don't be too hard on yourself. The most important thing is to learn from our experiences and have fun with the game. Can you imagine how many times a Grand Master has goofed up at the table? A whole lot more than we probably ever will. So every time we miss our best play, we have an opportunity to improve ourselves the next time that situation arises. Cards used to tell future, and make money, too. In 1432, Saint Bernardo warned the "Faithful" that cards were invented by the Devil, later picked up by the English Puritans -- often regarded a "The Devil's Picture Book". By 1495, Henry VII issued a Decree forbidding his servants from playing cards except during the Christmas Holiday. No wonder the Ace of Spades looks distinctive. Later, Elizabeth the First levied a tax on the manufacture of playing cards, which generated significant revenues for the Crown. By the era of Queen Anne, card playing was in full swing. Men preferred Piquet, women loved Ombre, while the Clergy and Country Squires played Whist. Have you ever wondered why the Ace of Spades looks so distinctive? Well, it was the official stamp of certification to indicate that the proper English tax was paid on that deck of cards (the Stamp Office kept the only stock of pre-stamped Aces of Spades) -- the card manufacturers were forbidden to produce that Ace. This tax hung around all the way onto 1960, yet the unique look of the Ace of Spades still is found on most decks. By the late 1400's, Suits began to appear on cards (the Suits -- Spades, Hearts, Diamonds, and Clubs are know as the French National Suits) -- the first three Suits are presumably adapted from the German Leaves, Hearts and Hawk Bells. Over the next 200 years, the Suits became standardized. Due to the intricate designs on the "face" cards, the cost to purchase playing cards was originally quite expensive (due to the hand painting) although that didn't keep the "commoners" from using them. Demand by the populous led to mass production using a technique using the woodcut. The card designs were carved on woodblocks, then inked and printed on paper. These papers were then glued to blank card stock. Around the mid-1400's, the French incorporated suit signs and flat silhouettes in only black and red colors. Faces on cards endure a political agenda. Eventually, the French began using ordinary stencils, which could be cheaply produced. Thus, the cost-effective French cards were widely used in England and the United States. For some time, the designations on the "face cards" varied, but when the French accepted Napoleon as their leader, they reinstated the notion of the King and Queen. However, Napoleon didn't care for their medieval look, believing they should be "archaeologically correct". So an artist was assigned to design authentic costumes on the cards. But Napoleon's cards weren't liked by the masses so the medieval cards resurfaced. Did you realize you have held "majesty" in the palm of your hand? The Rouennais pattern originated in the 1400's. While the French gave up the Rouennais pattern, it was exported to England which was subsequently used in the United States. Note - not all sources agree on who is represented on the card faces. The Parisian pattern was also introduced around this time and, despite some minor modifications, became France's standard deck of cards. Kings are the "Big Boys"
Judith is believed to refer to the wife of Louis I, or perhaps a reference to Isabelle, wife of Charles VI. Others feel Judith simply refers to the Judith described in Apocrypha that slew General Holofernes and his invading Army. Jacks were "hands on" fellows. Some believe that the 12 Honors of the deck refer to the 12 signs of the Zodiac or the 12 months of the year. They say the two colors (Red and Black) refer to the Solstice and Equinox phases. They see the four Suits as the four Seasons, the entire pack of 52 representing the 52 weeks of the year, and the 13 in each Suit being the same as the weeks in each quarter of the year (Winter, Spring, Summer, Fall). In 1857, the English began playing Whist in a "duplicate" method to eliminate most of the luck associated with the deal. In 1883, American's began playing inter-club matches. In 1891, a duplicate tray was invented, used to hold the cards separately so players could replay in an identical environment. The idea was to eliminate chance and provide a true test of skill. The boards were originally called the Kalamazoo tray. By 1893, Bridge was introduced in New York, using formal rules that were recently printed by Henry Barbey. Then in 1925, the American multi-millionaire Harold Vanderbilt, introduced exciting scoring bonuses (while on a cruise ship). With this change, auction Bridge became known as "contract Bridge". In 1931, Ely Culberton wrote the number one and two book sellers of any book, titled The Culbertson Summary and the Blue Book. Incidentally, a regular deck of playing cards is 8.9cm long x 6.3cm wide. But since our players hold 13 cards, the Bridge card is 8.8cm long x 5.7cm wide. Let's take a glimpse of how scoring motivates our players. Later in this course, we will cover scoring in greater detail -- for now, let's focus on the big picture for the game. If your commitment (Bid) and attainment (Made) are in harmony, you will score a good result. If your objective is at or above certain thresholds, you will receive a bonus. Of course, if you fail to meet your goal, you will face a consequence. Often it's better to stop bidding at the lowest level if we can't attain the the Bonus threshold. We obtain the same score whether we Bid 2 and Make 2 or we Bid 1 and Make 2. Try not to take risks unless there's a good chance for a Bonus in your future! Without getting into all the mathematics of scoring right now, here's a graphical representation. We failed to make our commitment so we receive a penalty. We made our commitment and receive a "Part Score" award. While we receive a fair Part Score award, we missed a Game Bonus. We make our commitment which was at the Game-level, so we are awarded a Game Bonus. We exceed our commitment yet do not get the extra award for Slam; instead, we receive only a Game Bonus. We achieve a Slam Bonus -- a handsome award! Oh oh, we bid the maximum possible but since we didn't make our bid, we don't get any bonus at all -- and are even penalized! In the Bridge bidding phase, the players conduct an auction to decide who will be the declarer. A bid specifies a number of tricks and a trump suit: Spades, Hearts, Diamonds, Clubs, or no trump (Notrumps). The side which bids attempts to win at least that number of tricks bid, with the specified suit as trumps. When bidding, the number which is said actually represents the number of tricks in excess of six that the partnership is committed to win. Thus, a bid of 3 Spades represents a contract to win at least 9 tricks (9 = 6 + 3) with Spades as trumps. Thus, the maximum number of attainable tricks is 7 (6 + 7). The baseline of 6 tricks is sometimes referred to as a "book". A bid of a larger number of tricks always beats a bid of a smaller number, and if the number of tricks bid are equal, the higher suit beats the lower. So the lowest possible bid is 1 Club and the highest is 7 Notrump (promising to win all 13 tricks without a trump suit). A few other bids are possible during the auction phase. The Pass is most common, stating the player does not wish to bid at that time. After an opponent (player to the left or right) makes a suit or Notrump bid, your side may also "double" the opponent's bid (or even "redouble" the opponents' double). Doubling and redoubling increases the score for the bid contract if won and the penalties if lost. However, at low contract levels many players instead use the double with a conventional understanding that the player wishes to compete further without naming a specific suit - the doubler's partner is expected to continue bidding; in that case, the low-level double asks partner: "Please do something intelligent!" If a player subsequently bids a suit or Notrump, all previous doubles and redoubles are cancelled. The dealer begins the auction phase, either passing or making a suit or Notrump bid preceded with the number of tricks committed (above the baseline 6 tricks "book"). After the dealer makes a bid (technically a call since the pass is actually not a bid), the player to the left (clockwise) may make a legal bid - one at the same level in a higher suit denomination or Notrump, or any suit at a higher level. The Bridge bidding proceeds until three player have passed after the final bid or call (including double or redouble) - after three passes the auction is over, the Bridge contract is established, and play begins. The objective of the Bridge play phase is to win tricks - the more tricks, the better your result. Since each player has 13 cards, the total number of tricks available is 13 tricks. 2. The highest ranking card of the suit led - if only the opening leader holds the suit and no one trumps the trick, even the lowly 2 will win the trick. The winner of a trick leads to the next. Each trick is gathered together and turned face down when complete. However, any player may ask to see the cards and ask who played a given card until your side has played to the next trick. The tricks won are to be arranged neatly in front of one member of the winning side so tricks can easily be counted during the play of the game. Duplicate Bridge has its roots steeped from Contract Bridge with two notable differences. Duplicate Bridge uses a different scoring method where the bonus value of each hand stands on its own, not dependent on the "part score" or game status from a prior hand. Generally, this is considered to be a good thing since each hand is bid based on its own merits. Secondly, to deemphasize the element of luck when dealt a strong hand, a Bridge pair bids and plays the *identical* hand with other players among a large number of contestants. When cards are shuffled before bidding and play, how can this be accomplished among a large number of players? Well, duplicate Bridge players do not intermix and reshuffle the cards after the play of a hand. Instead, after the first time the cards are played, each player carefully keeps their 13 cards segregated from their partner and the opponents. This way the duplicate Bridge players at other tables can bid and play the identical 13 cards to compare their results with the rest of the field. Thus, luck is much less of a factor since no one enjoys the "luck of the deal" in duplicate Bridge. Where to go next? Rather than get into the intricacies of scoring (let a seasoned player take care of the accounting), why not step up to the table and begin having fun? But if you are so inclined, please see THE SCORE. Have a great Bridge game!